Successfully Added COB LED Headlight - Weatherproof, 110 Lumen, Durable Design, 3 Light Modes, Up To 100,000 Hour Service Life (Orange) to your Shopping Cart. With this sophisticated 3 Watt headlight at your disposal, you will be able to head out after dark with confidence and never run into nasty surprises again. Emitting up to 110 Lumen, this powerful LED headlamp is capable of lighting up whatever lays in front of you – making it perfect to have at your side during upcoming camping trips, night-time hikes, or to have in your emergency tool box. Available for less than 3 US Dollar, this LED torch certainly is a cheap flashlight that brings stunning value for money and, with its 100,000-hour service life, it is guaranteed to light up your life for years to come. Crafted out of high-end and tough ABS material, this durable LED headlight has been designed to take a hit. Additionally, its IPX 4 weatherproof design lets you use it in any imaginable weather condition. Whether it’s hot, freezing, or raining – this powerful LED won’t let you down. Equipped with a comfortable headband, you’ll be able to wear this torch without even noticing it’s there. 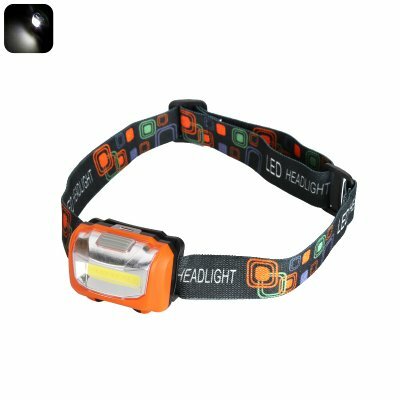 Its adjustable design furthermore lets you easily tighten or loosen the strap, making this COB LED headlight suitable for people of any age. With its three different lighting modes, you can be assured that you’ll always have the right type and amount of light available for any occasion. Its low light mode is perfect for those that work inside and simply need a little bit of extra brightness, while its high power mode is ideally for lighting up the road in front of you while walking outside. Additionally, it also features a flash mode that is perfect for grabbing the attention of people passing by or for making your presence known in traffic while cycling at night.